Pictures of the suspects responsible for stealing multiple iPhones from two cell phone stores in Montgomery County. Spring, Texas – September 10, 2018: The Montgomery County Sheriff’s Department is asking for the public’s help in identifying suspects responsible for stealing iPhones from two area cell phone stores last month. 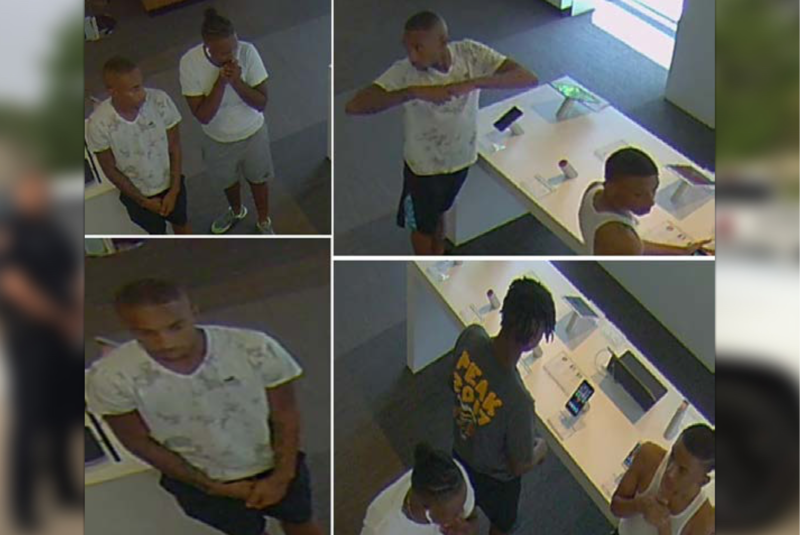 On August 26, 2018 at approximately 12:00 PM, the above pictured suspects entered the AT&T store located at 28033 Interstate 45 and stole several iPhones from the display by cutting the security cables. Approximately 30 minutes later, the suspects entered the T-Mobile store located at 525 Sawdust Road where they again stole several iPhones by cutting the security cables on the display phones. The suspects were seen leaving in a grey Mitsubishi passenger car. If you have any information regarding the suspects pictured above or information that could lead police to the individuals, please contact the Montgomery County Sheriff’s Office at 936-760-5800 or Crime Stoppers at 1-800-392-STOP (7867) and refer to case # 18A247385.